It was in the Spring of 1981 that I spent my first week in Venice, in the company of my wife, our children and my wife's parents. Since then we have made several more visits and I have progressively fallen ever deeper under the spell of this most beautiful and mysterious of cities. Many have written on Venice, its lagoon, its art and, perhaps most of all, its architecture. Many are the stories woven around its canals and calles. It is therefore an impossible task to acquire anything approaching a representative Venetian library; however over the period since our first visit, as if by a process of osmosis, significant books on Venice have filtered onto our shelves. 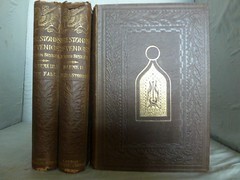 Following our initial visit, the first title I sought out was John Ruskin's monumental "Stones of Venice" and it was in the excellent Bay Bookshop at Colwyn Bay that I found a 3 volume set in the distinctive original boards, for the, then, very reasonable price of £15. It was when I had taken the set back to the car that I found this was actually the autographed edition, with each Volume 1 signed by Ruskin. "Stones of Venice" is an essential first step on the way towards a Venice collection, for surely no other writer of such brilliance has ever subjected the art and architecture of a single city to such forensic examination (or subjected his wife, the lonely Effie, to such strange continental holidays). Armed with Ruskin, the great gothic buildings acquire new significance, as survivals from an age of wonderful craftsmanship married to religious faith. Though I must confess that, unlike Ruskin, I think Venice enhanced by the magnificent Renaissance architecture, that Ruskin saw as evidence of its decline. If all you read in this wonderful work is the chapter on the Nature of Gothic, then you have read the defining statement that became the well-spring for much of William Morris's philosophy and the Gothic Revival. Since Ruskin, many have summarised, criticised and augmented his great work; to mention a few - Jan Morris, Sarah Quill and Robert Hewison. 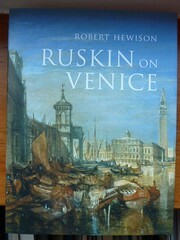 The latter's recent "Ruskin on Venice" is perhaps the final statement needed. 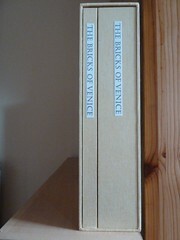 I must, however, also mention the beautifully produced "Bricks of Venice" by Peter Harris, published by the Old School Press, Bath in 2005 in a limited edition of 150 copies. This book studies the brick work of Venice in the gothic period and contains a text volume and a set of separate sheets of coloured illustrations, all housed in a slipcase. 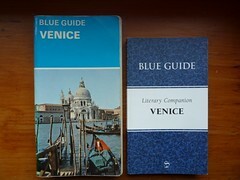 Of guides to Venice there are many; on our first visit we followed the Blue Guide and this remains the only book I consider essential to have to hand. 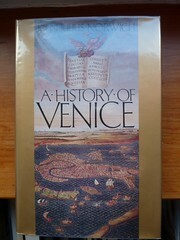 This now has a recently published companion - a Blue GuideLiterary Companion to Venice. J G Links's "Venice for Pleasure" is also excellent and the illustrations in the Eyewitness and Everyman Guides make these worth adding to the collection. 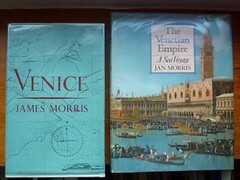 There are many companions to Venice, summarising its history and topography; perhaps most notably James Morris's "Venice", the introductory paragraphs of which are justly praised for their evocation of the first sight of Venice as you approach from the lagoon. As to history, I will name only three books I find on our shelves; the earliest is Mrs Oliphant's "Makers of Venice", which contains much detail of the lives of the doges and other historical and artistic information. 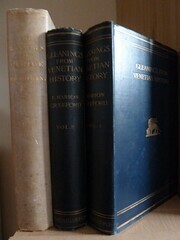 It appears in various editions and is well illustrated with portraits and topographical scenes. Next is F Marion Crawford's "Gleanings from Venetian History", beautifully illustrated by Joseph Pennell, one of the many artists associated with Venice. Both of these are lovely books in which to browse, but the key history to read is John Julius Norwich's "History of Venice", a captivating work, which is unlikely to be surpassed. Of art and literature, there are riches abundant. 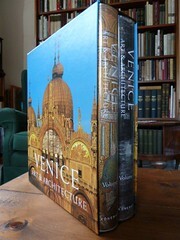 Venice's churches and galleries are enriched by works by Titian, Tintoretto, Carpaccio and Tiepolo and many are the glossy art books that reproduce their masterpieces, for example the massive two volume set "Venice Art and Architecture", published by Koneman in a slip case. Ruskin fell under the spell of the Carpaccio cycles - that of St George in the Scuola Grande di San Giorgio Degli Schiavoni and that of St Ursula in the Accademia and there are separate studies of these works and of Ruskin's infatuation with St Ursula, who he identified with his lost love Rose La Touche. 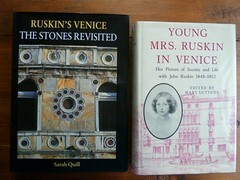 Two books tell the story of how on Christmas Day, 1876, Ruskin wandered the streets of Venice, observing signs left by Ursula/Rose. 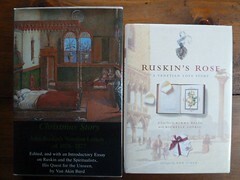 The definitive study is Van Akin Burd's "Christmas Story", while "Ruskin's Rose: a Venetian Love Story", by Mima Balia and Michelle Lovric is a beautifully produced re-telling of the story of Ruskin's obsession. On a recent trip to Venice, we followed the route Ruskin took on that grey Christmas Day, from the Piazza, up the Merceria to the lonely area of the Abbazia della Misericorda and along the Fondamente Nuove, looking across to the cemetery island of San Michele, and back to the Carpaccios in Scuola Degli Schiavoni. 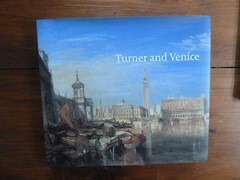 Many books contain studies of great artists who have worked in Venice, for example Ian Warrell's "Turner and Venice" and Alastair Grieve's "Whistler's Venice". 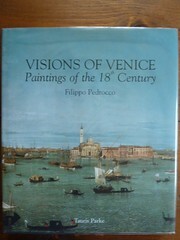 The great views of the 18th century by artists such as Canaletto and Guardi are well represented in Filippo Pedrocco's "Visions of Venice". For an account of the development of Venetian architecture, I would turn to Deborah Howard's "Architectural History of Venice". Of all cities, few have so inspired writers as Venice. 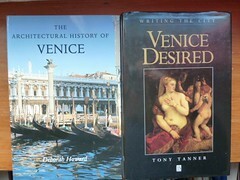 A very good survey, "Venice Desired" by Tony Tanner provides a summary of how Venice has affected the writings of, amongst others, Byron, Henry James, Marcel Proust and Ezra Pound. To this list we could add Thomas Mann, whose "Death in Venice" captures something of the melancholy that pervades Venice at certain times and seasons, when mists roll across the lagoon and the layers of history weigh heavy on this fragile city by the sea. 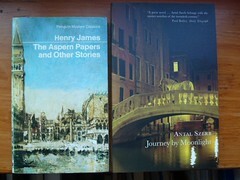 On the lighter side we have Henry James' "The Aspern Papers", concerning attempts to inveigle a collection of literary letters out of the ladies living in a crumbling palazzo, and Sally Vickers' "Miss Garnet's Angel", set around the church of Angelo Raffaele. I like the quote from Ruskin that prefaces this story - 'If some people really see angels, where others see empty space, let them paint the angels ....' We should be eternally grateful that so many have indeed seen the angels in Venice and have shared their visions with us. 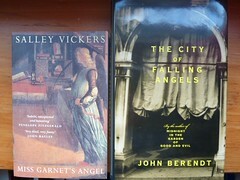 Speaking of angels, mention must be made of John Berendt's "City of Falling Angels", which follows the investigations into the fire that badly damaged La Fenice in 1996. The Opera House is now once more restored. Our last visit to Venice coincided with the Architecture Exhibition at the 2010 Biennale. Here in the British Pavilion on the first day of the exhibition, we could see Ruskin's Venetian Notebooks, on loan from Lancaster University. In these notebooks Ruskin used to write the word 'Done' on pages, from which the drawings or records he had made had been transcribed to the next level. 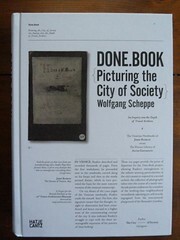 Facsimiles of these pages, together with more recent photographs, are provided in Wolfgang Scheppe's "Done Book". I have, however, the feeling that we can never 'do' Venice. There will always be unvisited campos, uncrossed bridges and calles less travelled that lead us deeper into the secret places of the city. Finally, tribute must be paid to Aldus Manutius, the greatest of Venetian printers, who arrived in Venice in 1490 and established the Aldine Press. 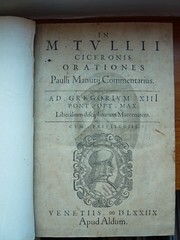 At this press he produced the first small format editions of the classics, inventing also italic type. 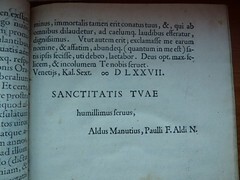 These Aldine Press octavo volumes became the world's first mass-distributed books and hence are the earliest precursors of today's best sellers.